For almost three decades, the path to the White House has wound through the ivy-coated campuses of the United States’ elite universities. And despite the populist tinge of much of U.S. politics these days, that fact doesn’t appear to bother most Americans. In a new Pew Research Center survey, a large majority — 74% — of Americans say it wouldn’t matter to them one way or another if a presidential candidate went to “a prestigious university such as Harvard or Yale.” About a quarter say it would matter: 19% say they’d be more likely to support such a candidate while 6% would be less likely. Those views have changed very little since 2007. Since the election of George H.W. 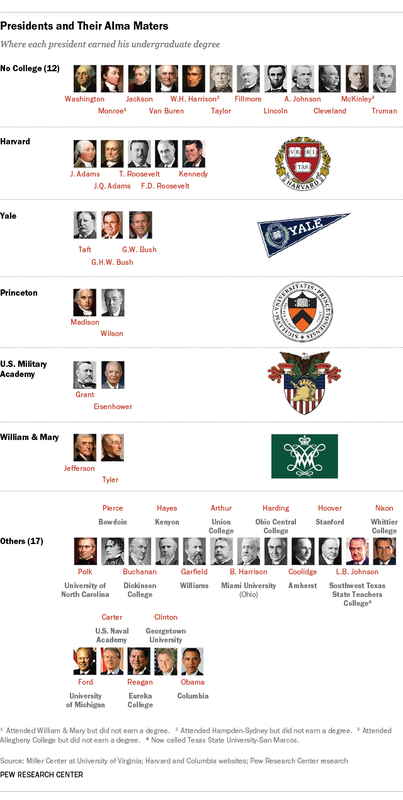 Bush (Yale ’48) in 1988, every president has had an undergraduate or graduate degree, or both, from an Ivy League school. The 2012 election, in fact, was an all-Harvard affair pitting Barack Obama (J.D., class of 1991, following his bachelor’s degree from Columbia) against Mitt Romney (J.D./MBA, class of 1975, with his bachelor’s from Brigham Young University). Harvard has the greatest claim to being a White House prep school: Eight presidents have earned bachelor’s or graduate degrees there, starting with John Adams (bachelor’s 1755, master’s 1758). Future presidents who did attend college overwhelmingly went to private institutions (though to be fair, there weren’t many public colleges or universities until after the Civil War). In total, only nine presidents have received their undergraduate degrees from public universities (including the service academies). The Pew Research survey found that young people, minorities and those with less education are more likely to have a positive view of a candidate who attended a prestigious university. Roughly a quarter of liberal Democrats (27%) say they would be more likely to support such a candidate, compared with just 11% of conservative Republicans. There’s no group in which more would have a negative than positive reaction to a candidate with an elite education, including Republicans and leaners who agree with the Tea Party. 10% of Tea Party Republicans say they would be more likely to support a candidate who graduated from a prestigious school, 10% said less likely, and 79% say it wouldn’t matter.